With aspirations in a different genre of music, Tom had to satisfy his rock ’n’ roll appetite. This hunger landed him on the doorstep of one of the most famous rock studios in the South, Southern Tracks. 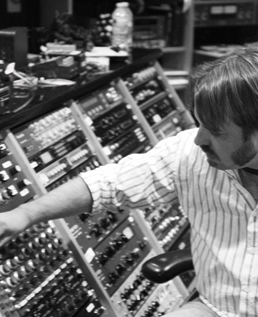 In 2004 he was hired to be chief engineer, but quickly proved himself an indispensible cohort of Nick DiDia and world famous, multi-platinum selling, Grammy-award winning producer Brendan O’Brien. Tom had the privilege of becoming part of O’Brien’s elite team and for the next five years engineered records for Pearl Jam, Bruce Springsteen, Incubus, Augustana, Trey Anastasio, Audioslave, Train, Velvet Revolver, The Offspring, The Wallflowers, Billy Talent, The Bravery, and Mastodon. After years of success at the helm of Southern Tracks, Tom left in 2009 to pursue another true calling of his heart, country music. In the last few years Tom has been splitting his time between Nashville and Atlanta working with the likes of Sugarland, Faith Hill, Martina McBride and super producer Byron Gallimore. He also contributes his exceptional talents producing hits for indie artists, The Goldest, Dead Rabbits, Six Shot Revival, and Zruda. Currently Tom is the right arm of production wizard Kristian Bush and runs a private studio out of Decatur, Georgia. He’s involved in publishing and song production with a variety of artists spanning the genres he’s showcased throughout his illustrious career. Tom is managed by King Music Group, Inc. For bookings contact: Stephanie Wallin 404-403-7553 or stephanie@kingmusicgroup.com.